Women's Empowerment Luncheon presented by Black Women of Achievement. 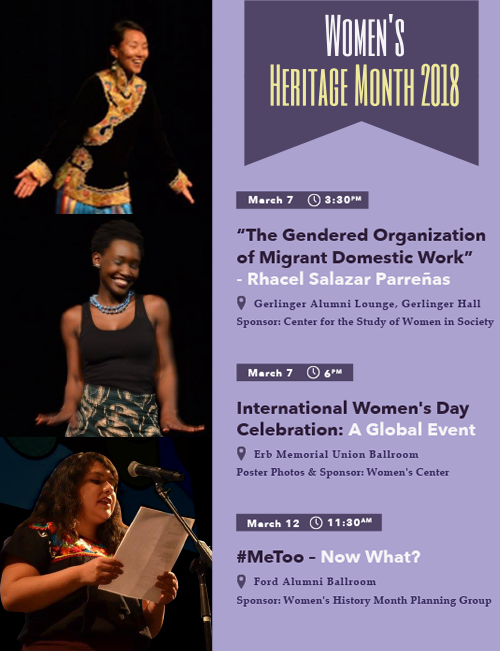 Judge Yassmin Barrios, "Justice and Reparation in Guatemala: Challenges and Possibilities"
Women’s History Month was initiated in the U.S. in 1978 as “Women’s History Week” by the the Education Task Force of the Sonoma County (California) Commission on the Status of Women. After the great success of the local celebration, dozens of schools planned special programs for Women’s History Week. Over one-hundred community women participated by doing special presentations in classrooms throughout the country. In February 1980 President Carter issued the first Presidential Proclamation declaring the Week of March 8th 1980 as National Women’s History Week. By 1986, 14 states had declared March as Women’s History Month. This momentum and state-by-state action was used as the rational to lobby Congress to declare the entire month of March 1987 as National Women’s History Month. In 1987, Congress declared March as National Women’s History Month in perpetuity. A special Presidential Proclamation is issued every year. Yes We Can shared struggles unique to girls and women, and featured information and stories from around the globe, across the state, and specific to the UO. Stories from Girl Rising, the Emmy nominated documentary directed by Richard E. Robbins, shed light on the import role education plays in breaking the cycle of poverty. The program included a panel discussion with a focus on the unique challenges girls and women face in Oregon and the UO and represented perspectives from the film Girl Rising, The Women’s Foundation of Oregon, UO faculty, undergraduate and graduate students.